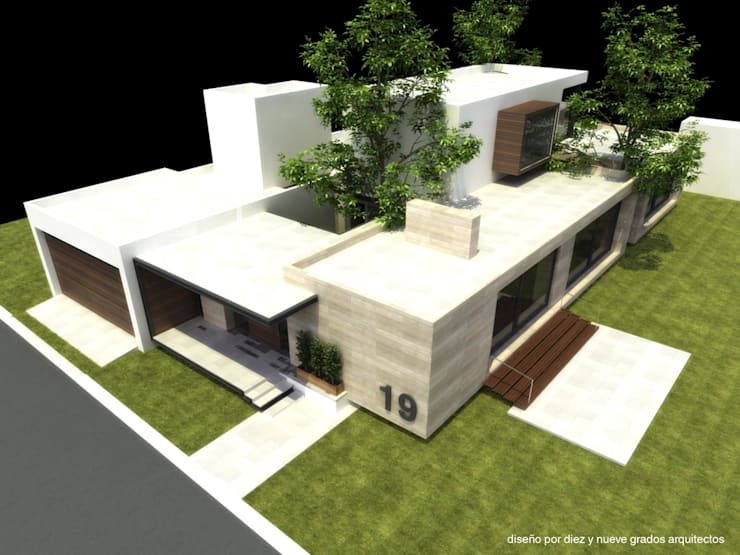 Today, we are going to explore a beautiful family home by design professionals Diez Nueve Grados Architects. 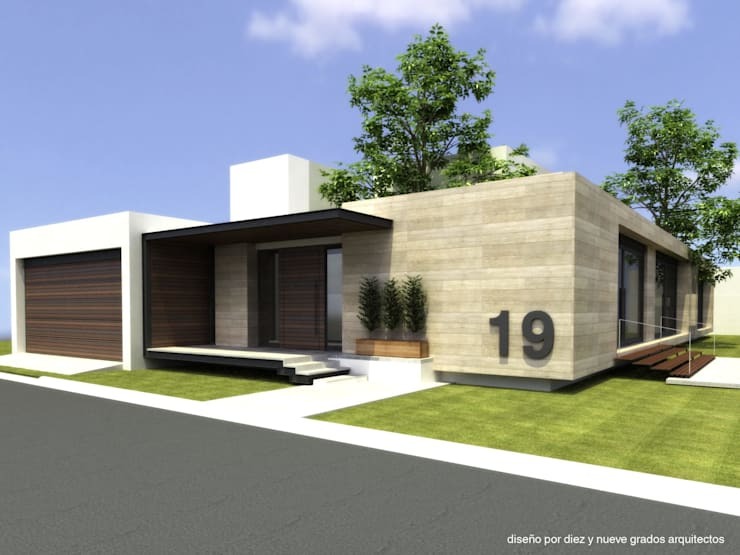 We will examine the artist's impression of this stylish, modern and sophisticated home and see how every detail and element was considered. Each of these pieces comes together in perfect harmony. This home features clean lines and a very contemporary look and feel. You will also see how the garden plays a role in the entire design as well as how neutral shades and earthy tones make for a very appealing home. Once you are done taking a walk through this home, you'll want a sophisticated and elegant home just like this one for yourself! As we can see from this angle, the home is very appealing, warm and welcoming! The flat roof neatly packages a modern home beneath it, while the mix of smooth white walls and light wooden cladding creates a contrast between textures. Don't you love the large 19 , which clearly shows guests and visitors what number the house is? Little steps lead up to a covered entrance, which keeps guests, visitors, family and friends protected from the hot sun, wind or rain as they wait for the door to be opened. The wooden planter with the three little Christmas trees adds a subtle form of decor to the space. Do you see how dark wood, light wood and white tones work together? 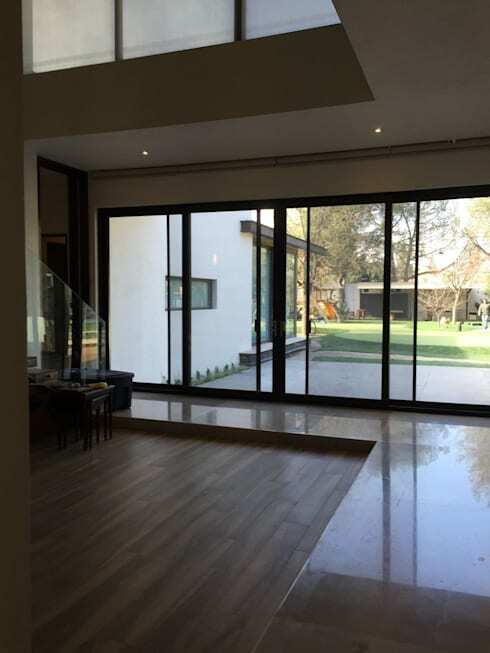 From this angle, we can see how large glass sliding doors allow for a seamless connection between the interior and exterior spaces. This allows the living area to spill out onto the gorgeous and spacious garden. A white platform creates a little terrace in the garden. This is very sleek and savvy! It also become clear from this angle just how sleek and modern the architecture is. 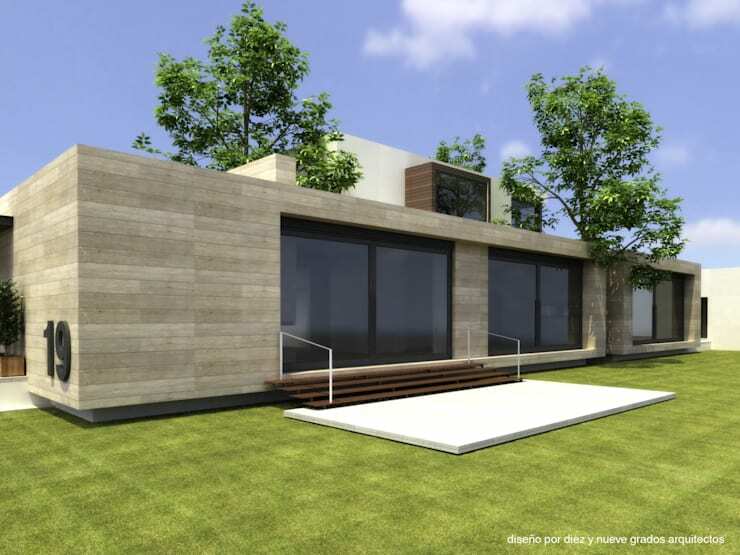 The cube shape, flat roof and box structures makes for a very impressive yet subtle design. If we look at the house from the top, we can see just how expansive and impressive it is. The home also extends up a level in certain parts, creating a unique and stylish home. We can also see how little garden courtyards have been inserted throughout the design, breathing new life into the interior design. Do you see how the designers have worked with every square inch available to them, spreading the home over the property? If head inside the house, we come across a very savvy and impressive living area. A partial grey stone wall subtly separates the living room from the dining room, while still allowing the rooms to flow into one another. A fireplace rests in the grey wall in a very sophisticated and modern design, showing how functionality and style go hand in hand. A mix of materials creates a gorgeous interior design while the injection of raw materials throughout brings a slightly rustic touch to the modern home. Colour and patterns have been injected into the living space in the form of cushions, artwork and a pot plant. In this area of the home, we really get a sense of how artwork allows the home to be filled with charm and personality. We really get a sense of the family members' style here. A funky lamp hangs over the orange table—another great example of style and sophistication working hand in hand. 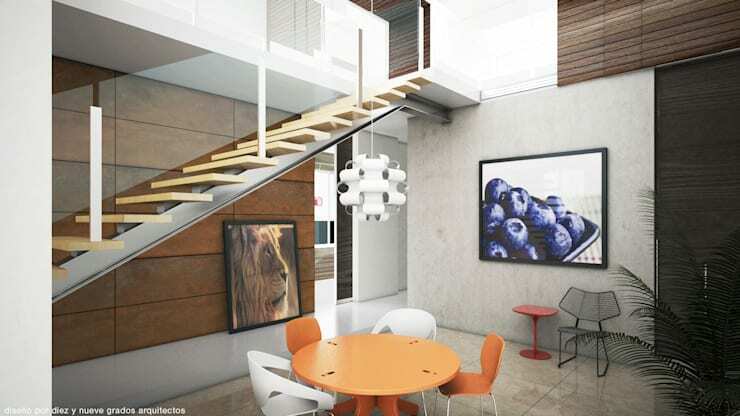 The wooden floating staircase is just as savvy. Remember that a floating staircase can bring a very unique touch to a family home. 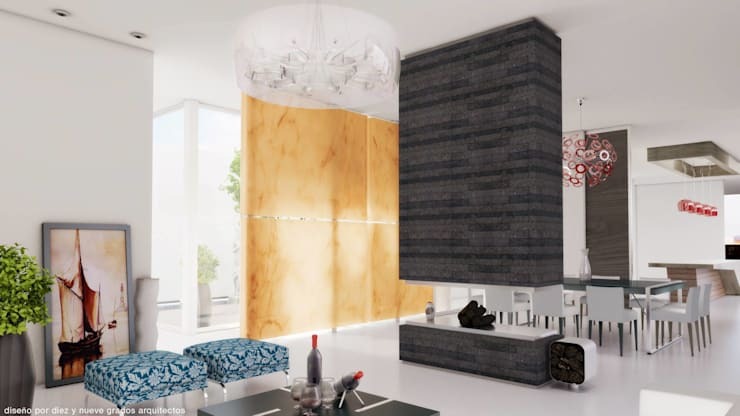 Wood is a great material as it is warm and earthy as well as durable. Have a look at these wooden staircases that wow for inspiration for your own home! 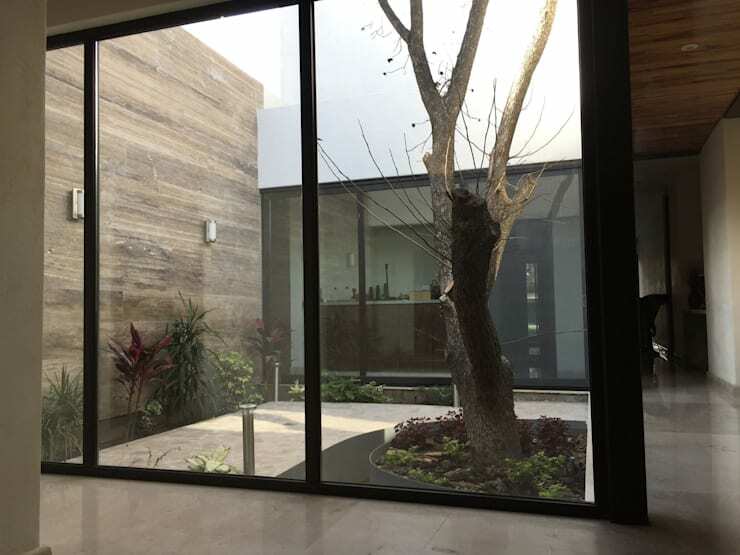 In this image, we can see how the garden courtyards have been injected throughout the interior space. This breathes new life into the home, creating green spaces throughout. It fills the home with natural light and allows for a seamless connection between interior and exterior spaces. Natural light is a must for any modern home, creating a very light, bright and spacious home. From this angle, we can see how an open plan design allows the social spaces of this home to flow into one another. This makes the home seem feel very large and spacious. Here we can also see how large glass windows and doors allow the home to spill out onto the garden and again, fills the home with natural light and fresh air. The light wooden floors and neutral tones creates a warm and tranquil environment that envelopes the family in serenity. If you've enjoyed exploring this home, you'll love this one too: The family home with a big surprise in the backyard.